Clinical Problems in Medicine and Surgery is a departure from traditional medical textbooks in that it deals with the real problems of clinical medicine through scenarios encountered in the emergency department, on the wards and in outpatient clinics. 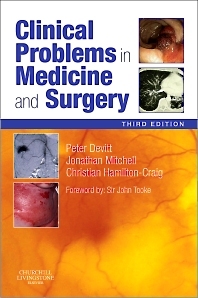 First published in 1992, the book has found great popularity with medical students, residents and interns about to experience, or already experiencing, the real world of medical practice. The book comprises 55 real-life medical scenarios to illustrate important everyday principles in clinical medicine. For this new Third Edition the successful format of case presentation, interspersed with questions and answers, and a final synopsis of key material, has been retained, while new cases have been added and the many useful web-links updated. With the assistance of expert colleagues across three continents, each problem has been revised and updated. New images have been added which reflect the extensive changes in the field of minimally invasive diagnostics. Searching questions will guide the reader towards further self-directed learning. This book does not purport to be an exhaustive text on clinical medicine. Nor is it a replacement for real-life clinical experience and the hands-on teaching of expert clinicians. It is designed rather as a wide-ranging source of information and a practical aid to the management of clinical problems. The authors hope it will instil in the reader a real sense of excitement and curiosity towards further learning. • A highly praised book that tackles important medical and surgical topics from a problem-oriented angle. • Adopts a case scenario approach which will encourage critical thinking and develop problem-solving skills. • The cases cover all common and important problems likely to face the newly-qualified doctor in the casualty department, on the wards or in the clinic. • The questions although set in the context of the case are designed to test the reader’s overall understanding of the most relevant aspects of each topic. • Well-illustrated with clinical photographs, pathological images and radiological scans and x-rays. 41 "Jack has leg weakness"